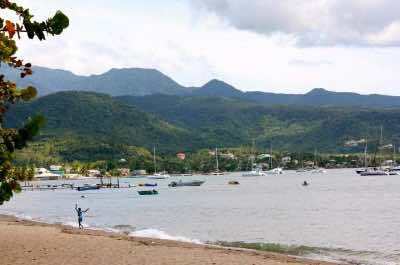 Dominica Beaches are some of the best in the Caribbean and around the world. Dominica beaches offer a wide variety of beautiful sand from white to black in color as well as a variety of volcanic rock formations. The tropical landscapes of palm and coconut trees offer a chance for you to enjoy a little shade when needed. 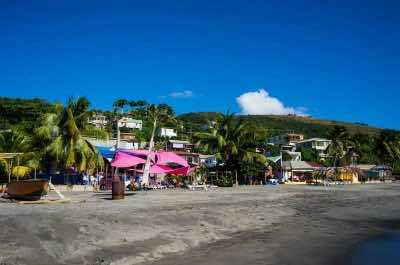 Many of the beaches like Mero and Purple Turtle are situated near cities like Roseau as well as Portsmouth and offer a gateway to many other things to do in Dominica. Activities for you to enjoy at Dominica beaches range from snorkeling and scuba diving in a maze of underwater bubbles at Champagne Beach to sitting in a natural hot springs on the shoreline at Soufriere Bay Beach. No matter what beach you choose, you will surely be pleased with the sand, scenery and natural beauty. The Mero Beach is one of the hot spots of the island. Typical of the Dominica beaches, it has the rocks of volcanic nature. The Mero Beach is the closest one to the capital of the island - Roseau - and it offers comfort for those that are travelling on vacation with the family. Beyond great restaurants, you can use public bathrooms with showers. The beach is placed in a strategic area, where you can easily reach an adventure park, the Wacky Roller. 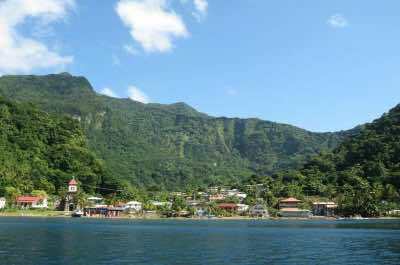 This park is perfect for those that want to include adventure sports among the things to do in Dominica. Enjoy the visit to the Mero Beach to explore the capital or take an island tour, when you have a chance to discover amazing surprises. The Purple beach is a hidden treasure of Dominica Island and it shouldn't be missed. Close to the Portsmouth city, this gray sand beach combines the wonders of nature with convenience. You can reach the beach by car and easily find a parking spot. The gray sand and the coconut trees make a contrast with the blue ocean, turning the landscape just spectacular. The Purple Beach is one of the best Dominica beaches and it can't be missed. You can hire a tour that leads you by boat through the Indian River, take you to know the Fort Shirley and finally, arrives at the beach. The Purple Turtle beach is where You'll relax while contemplates the sea waters. Enjoy the opportunity to have a pleasant lunch at the Purple Turtle Beach Club, located here. Champagne Beach is an ideal choice for you to visit when you want to experience one of nature’s fascinating underwater wonders. Located on the southwestern coastline of the island near Scotts Head Village, Champagne Beach has excellent opportunities for swimmers, scuba divers and snorkelers. This Dominica beach features a wonderful landscape of black volcanic rock formations, palm trees for shade as well as spaces of black sand along the shoreline. Due to the volcanic make-up of the sand there can be sharp rocks on the beach. One of the more spectacular features of this beach is the underwater volcanic activity which forms bubbles in the water when releasing air from the hot springs which penetrate the ocean floor. With hundreds of bubbles of all sizes being released, you will be amazed at the density of the water as you snorkel. Just off-shore there is a coral reef - Champagne Reef - for you to explore which is chocked full of colorful marine life and even more bubbles. When you get thirsty you can find tropical libations at Melvin’s Champagne Bar and Restaurant. 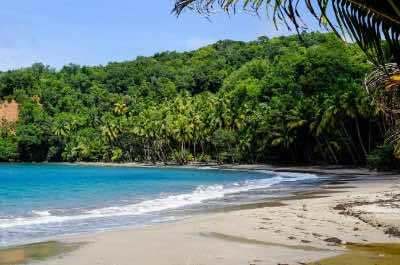 Batibou Beach is one of the must see Dominica beaches while you are visiting this beautiful tropical paradise. Located along the northeastern shoreline of the island near Calibishie, Batibou Beach is an ideal stretch of white sand beach that offers excellent swimming opportunities on the Atlantic Ocean side of the island. The crescent-shaped beach area has an excellent tropical landscape with coconut and palm trees for shade as well as plenty of space for your lounger. The water at Batibou Beach is clear with several shades of blue for you to gaze upon and there is a small coral reef offshore for snorkelers to enjoy. Batibou Beach is one of the more isolated Dominica beaches you can visit and you will need to either walk short distance from the main road or take a 4-wd vehicle. Sometimes there is a small beach bar that is open or you can take your own picnic. Soufriere Bay Beach is one of the more unique Dominica beaches you can visit while you are exploring this fabulous tropical island. Located along the southwest coastline near Scotts Head, Soufriere Bay was created by a submerged volcanic crater and is one of the few Dominica beaches that have pools of warm spring water for you to enjoy. 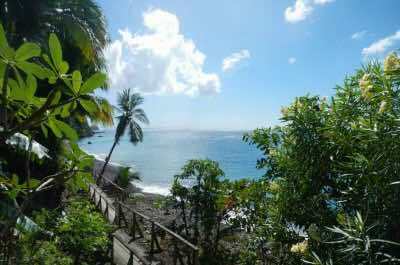 Soufriere Bay Beach is secluded with a somewhat rocky shoreline and a few strips of black sand for you to enjoy. The volcanic activity in this area is evident as you gaze out on large black volcanic formations that are intertwined with the lush tropical landscape. Scuba divers and snorkelers have flocked to this area to view a large number of these formations underwater which are home to numerous species if marine life. When you are underwater you can even few the numerous hot springs which release warm air bubbles into the Caribbean Sea. If you get thirsty there are plenty of options nearby including the Bubble Beach Bar and Spa which serves fantastic tropical libations beachside.